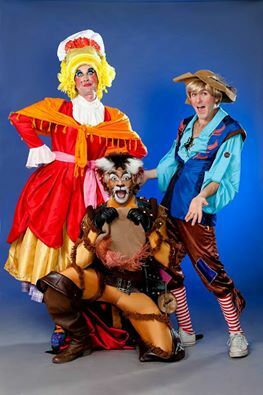 I remember sending a message to Steven Stead, artistic director of KickStArt Theatre Company, after seeing Disney’s film version of Into the Woods whether he had plans to do a stage version. He just said ‘watch this space’. KICKSTART Theatre Company’s Shrek The Musical is big, green and fabulous. Artistic director Steven Stead says it’s the most expensive show the award-winning Durban company has produced and, having seen it, I can believe it. Designer Greg King has pulled out all the stops to create a myriad gorgeous sets, puppets and a gigantic love-sick dragon (voiced by Shelley McLean and manipulated by Peter Court). The Broadway musical is based on the DreamWorks animation filmShrek, and tells the story of a solitary ogre (played by Lyle Buxton) who is forced to leave his comfy swamp when it’s invaded by a host of fairy-tale characters including Pinocchio, the Three Bears, the Three Little Pigs, a Wicked Witch, the Big Bad Wolf, Peter Pan, the Ugly Duckling, the Fairy Godmother, the Sugar Plum Fairy and the Shoemaker’s Elf. They have been evicted from their homes in the Kingdom of Duloc by the controlling — and diminutive — Lord Farquaad, brought to life in a superb performance by Cobus van Heerden who spends almost every scene he is in on his knees. His song and dance number What’s Up Duloc? is a triumph. Shrek decides to confront Farquaad and along the way (reluctantly) teams up with a talkative Donkey, played by Rory Booth, whose scene-stealing performance is a joy to watch. I especially loved the number Make a Move, in which Donkey does a bit of a James Brown/Steve Wonder number while accompanied by the Three Blind Mice. But I digress. When Shrek and Donkey arrive in Duloc, Farquaad decides to use the ogre to rescue Princess Fiona from her dragon-guarded tower so that he can marry her and become king. In return, he promises to give Shrek his swamp back. This pair of unlikely heroes soon rescue the feisty princess, played by Jessica Sole, who has a great vocal range and wonderful comedic timing. But things get complicated when Shrek and Fiona fall for each other on the way back to Duloc. Shrek The Musical is packed full of toe-tapping show tunes, hilarious references to other musicals, including Disney’s The Lion King, and moments which will live long in the memory — Shrek and Fiona’s farting and burping contest and Gingy the Gingerbread Man’s “torture” scene spring to mind. Stead has drawn wonderful performances from his talented leads and ensemble. And together with King and his creative team of Tina le Roux (lighting), Stephanie Pais (sound) and Shanti Naidoo (the enormous array of colourful costumes), they have created the biggest, brightest musical comedy you’re likely to see this year. Theatre goers simply cannot afford to miss Shrek The Musical, and if you don’t leave the theatre humming along to Neil Diamond’s I’m A Believer then I’m as big a liar as Pinocchio. • Shrek The Musical is being staged at 7 pm, Tuesday to Saturday, and at 2.30 pm on Saturdays and Sundays, at the Elizabeth Sneddon Theatre on the Howard College campus of the University of KwaZulu-Natal in Durban. Booking is at Computicket. Please note: no children under six. This review was first published in The Witness.